Anybody? want to go up at the very least it is going to be a beautiful day and out and about, if you are interested PM me and I will send my phone number..
Great, thanks. I can't make it up this weekend, but if the trails are holding up I would like to make 1 more trip out next weekend. We'll see. Here is a picture of the walk way up to our lake home as of last Friday as you can see there is still lots of snow, the snow was at least two feet deep with a slight crust on top, the lake house faces east so it gets lots of sun, so yea I think there will be at least a couple weeks of good snow. Right on! Thanks for the report and picture. Still plenty of snow, I'm planning on at least two more weekends, with a third possible...? To get to my place I ride on Louise and then take the Crosswind lake trail for a ways. The Crosswind trail on Saturday was impeccable. The grooming that had been done prior was holding up nicely. 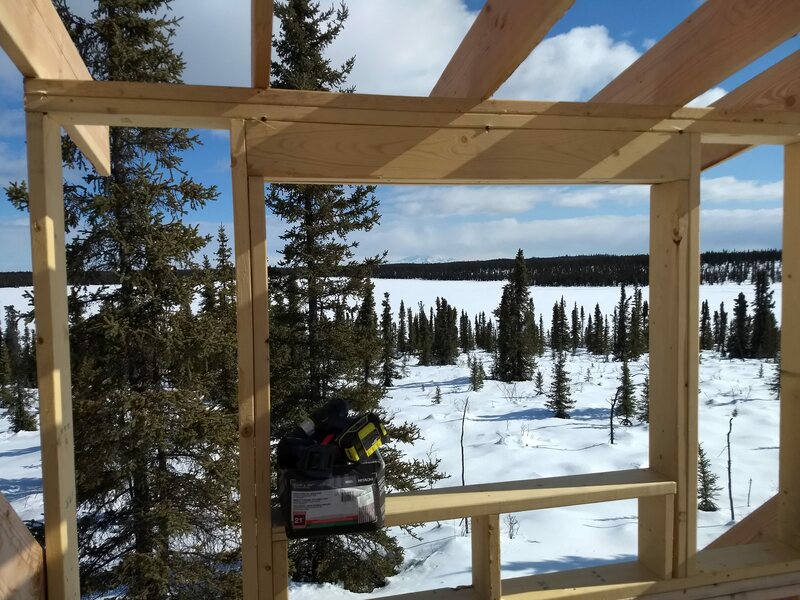 Working on the cabin. Spouse decided the loft needed a dormer window, so I framed that up on Sunday. Should be getting sheathing on this weekend. That's awesome man! I love the view out your dormer window. Nice clean framing too! Thanks for the report. Looks like you are doing a great job, also looks like lots of snow in your area. 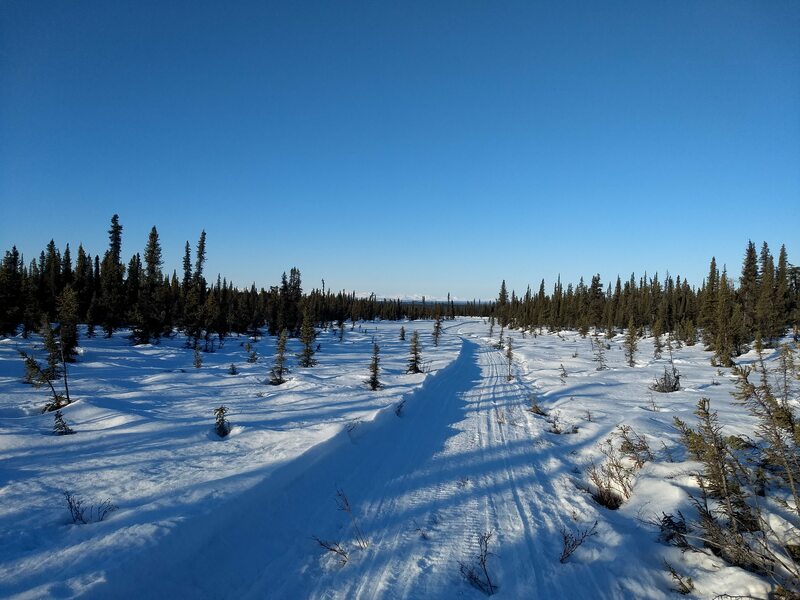 Thanks, I am going up on Sunday, I have had conversations with folks back on Susitna and they have told me that the snow condition are very good, I am trying to get my ATV back to the lodge and I am not sure I am going to be able to do it as there is still a lot of snow. So here's what the trail to our place looked like on Monday morning, a couple miles east of Lake Louise. Winter total snow fall 21 inches with compression about 12 inches no base, ground is frozen hard, light fluffy snow. The ice is good, no overflow reported.no grooming is being done due to frigid temperatures. Lake Susitna has been marked from the channel on both sides of the lake. Lake Louise Lodge through Cameron Cove and down the East side almost to Dog Creek. The trail from Three Lakes Rentals to Lake Louise Lodge and the Mendeltna trail to Bob Lake where both groomed. The Copper River Sled dog race is on this weekend, most teams will be coming through on Sunday through Monday at the Point lodge check station. Ice is 12 to 18 inches. Travel in pairs is advisable.